A Hound of Tindalos is a fictional creature created by Frank Belknap Long and later incorporated into the Cthulhu Mythos when it was codified by August Derleth. They first appeared in Long's short story "The Hounds of Tindalos", first published in the March 1929 issue of Weird Tales. Lovecraft mentions the creatures in his short story "The Whisperer in Darkness" (1931). In Frank Belknap Long's original story, which deals with the main character experimenting in time travel with the help of psychedelic drugs and esoteric artifacts, the Hounds are said to inhabit the angles of time, while other beings (such as humankind and all common life) descend from curves. Though the Hounds are sometimes pictured as canine, probably because of the evocative name, their appearance is unknown, since neither Long nor Lovecraft describe them, arguing they are too foul to ever be described. Long's story states that their name "veils their foulness". It is said that they have long, hollow tongues or proboscises to drain victims' body-fluids, and that they excrete a strange blue pus or ichor. They can materialize through any corner if it is fairly sharp—120° or less. When a Hound is about to manifest, it materializes first as smoke pouring from the corner, and finally the head emerges followed by the body. It is said that once a human becomes known to one of these creatures, a Hound of Tindalos will pursue the victim through anything to reach its quarry. A person risks attracting their attention by travelling through time. The story of the Hounds is retold in brief by William S. Burroughs in his novel The Place of Dead Roads. The Hounds chase the time travellers Titus Crow and Henri-Laurent de Marigny, respectively, in Brian Lumley's novels The Transition of Titus Crow and Elysia. John Ajvide Lindqvist's short story "Tindalos" references Long's story. Its main character is haunted by a being sharing many attributes with the creatures in "The Hounds of Tindalos", and she reads Long's story as a way of gaining an understanding of the chewing sound that haunts her. The hounds also appear in Roger Zelazny's fantasy novel The Changing Land, attacking the main characters as the house they are in travels through time. A hound of Tindalos appears in Michael Cisco's short story "The Firebrands of Torment" in such a way as to suggest that the protagonist might actually be its offspring. In the short story "Mongoose", by Sarah Monette and Elizabeth Bear, the Hounds are described as the apex predators of an extra-dimensional food chain that also includes the bug-like Toves and large-mouthed, eyeless Raths. They are referred to by the scientific name Pseudocanis tindalosi. Lawrence Santoro's Bram Stoker-nominated novella, God Screamed and Screamed, Then I Ate Him, features the Hounds of Tindalos. The story was worked into Santoro's novel Just North of Nowhere. In Meddling Kids, a novel by Edgar Cantero containing many allusions to the Cthulhu mythos, the hounds of Tindalos are mentioned as part of a TV show called Xira: Princess Warrior, a spoof of Xena: Warrior Princess. In The Apocalypse Codex, a Laundry Files novel by Charles Stross, Persephone Hazard and Johnny McTavish encounter a hound in the Hall of Singers in Neuschwanstein. In the Warhammer 40,000 novel Gods of Mars, written by Graham McNeill, the Hounds of Tindalos are referenced as the "Tindalosi", an ancient group of nearly indestructible hunter-killer machines. Millions of years before the events of the novel, the Tindalosi effectively made warfare obsolete by assassinating commanders within hours of their appointment. They were seen as too dangerous by their creators and were abandoned until the novel's antagonist discovered and reactivated them. The Hounds are referenced twice in Haiyore! Nyaruko-san. In one episode, Nyaruko offers to make Mahiro a hot dog using Hound of Tindalos meat; Mahiro angrily responds "Go bang your head on the angles of time!" In another episode, the corners of Hasuta's bedroom are shown to be covered with putty (presumably to proof his room against the Hounds). The Lovecraft-inspired band The Darkest of the Hillside Thickets has a song called "Sounds of Tindalos" on their album Spaceship Zero. A series of Yu-Gi-Oh! cards, the "Tindangles", are based on the Hounds of Tindalos, and appear in the Yu-Gi-Oh! VRAINS anime. 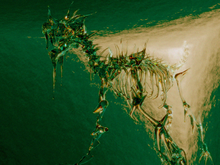 Renditions of the Hounds of Tindalos, or creatures named after them, are featured in the video games Final Fantasy X-2, Alone in the Dark: The New Nightmare and Shadow Hearts. References to the Hounds of Tindalos and 'Tindalos Doorways' can be found in the Children of the Mirror videos by Wham City Comedy. Metallica has a song about the Hounds titled "All Nightmare Long" on their Death Magnetic album. Hounds of Tindalos are enemies in the Pathfinder Roleplaying Game; their abilities and lore as detailed in the game's Bestiary 2 are almost identical to those described by Long. ^ Emrys, Ruthanna (21 July 2015). "Avoiding Angles is Harder Than It Sounds: "The Hounds of Tindalos"". Tor. Retrieved 27 February 2018. ^ Ramos, Octavio (21 October 2014). "Lovecraftian Beasties: The Hounds of Tindalos". AXS. Retrieved 27 February 2018. Long, Frank Belknap. "The Hounds of Tindalos" (1929). In Tales of the Cthulhu Mythos (1st ed. ), Random House, 1998. ISBN 0-345-42204-X.